Allows to filter production data (starting date and ending date, machine, family, customer, order, area, yard), show data and print reports according to the selection. 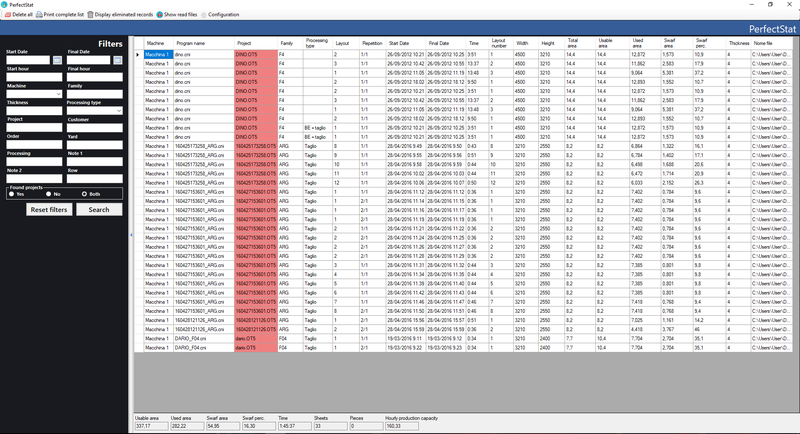 For the monitoring Perfect Stat uses reports, that can be filled by Intermac numerical control (if provided by the machine) or by Perfect Stat Monitor module that reads barcodes printed on layouts of Perfect Cut. Provides also an user interface for data management (delete older or wrong data). For the usage of Perfect Stat the cutting project has to be saved on the SQL Server database when it is sent to the Numerical Control. Perfect Stat analyze the reports that are not processed yet, reads the Perfect Cut projects, and append on statistical database (SQL Server) the report datas and useful informations for the statistics: sheet wastage pieces informations (dimensions, customer, order number, machining, grinding, low-e removal, delivery area, yard, etc. ).